On Nov. 21, 1864 US President Abraham Lincoln wrote a letter to Colonel William F. Elkins. "I see in the near future a crisis approaching that unnerves me and causes me to tremble for the safety of my country. As a result of the war, corporations have been enthroned, and an era of corruption in high places will follow, and the money power of the country will endeavor to prolong its reign by working upon the prejudices of the people until all wealth is aggregated in a few hands and the Republic is destroyed. I feel at this moment more anxiety for the safety of my country than ever before, even in the midst of war." It has been written that Lincoln had a vision of his death by assassination ten days before he was killed. 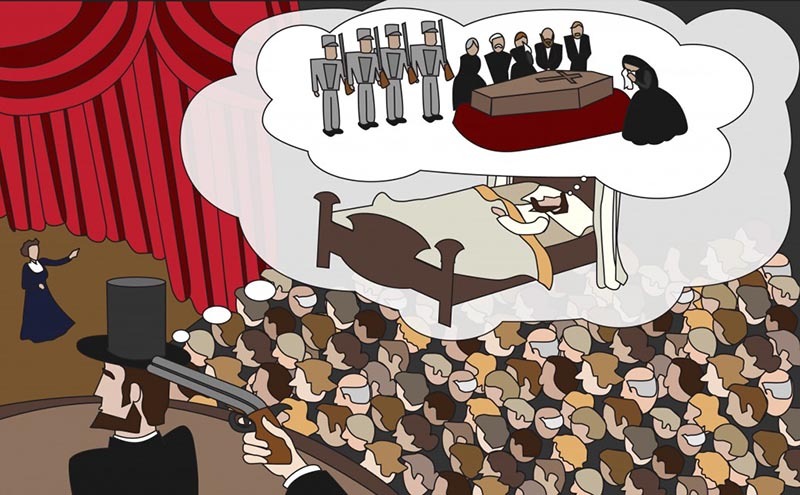 Many people sense their own death before it happens. Some people see a vision of what is going to happen yet cannot change it while for others it is just a feeling. What is going on is the consciousness of the person moves forward in the timelines of reality. It is not so much prophetic as it is science and math if you understand the nature of reality as a hologram. A gold watch owned by Abraham Lincoln bears a message marking the start of the U.S. Civil War, but the president never knew of the "secret" inscription uncovered on Tuesday at the National Museum of American History. The engraving, by watchmaker Jonathan Dillon, is dated April 13, 1861, and reads in part: "Fort Sumpter was attacked by the rebels" and "thank God we have a government." 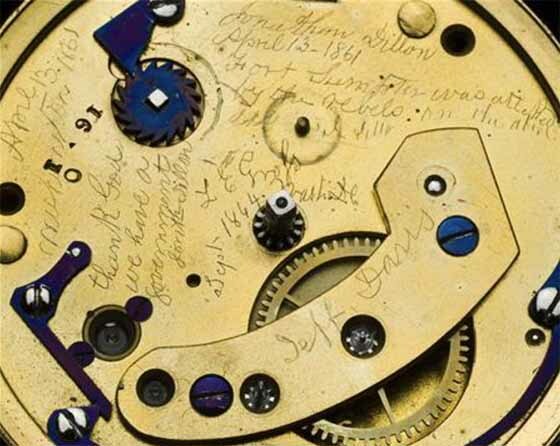 The museum said it agreed to open the watch to find out if the message really was there after it was contacted by the watchmaker's great-great-grandson, Doug Stiles of Waukegan, Illinois. The American Civil War began when Confederate troops opened fire on Fort Sumter in Charleston, South Carolina, on April 12, 1861. Forty-five years later, Dillon the watchmaker told The New York Times that he was repairing Lincoln's watch when he heard that the first shots of the Civil War had been fired. Dillon said he unscrewed the dial of the watch and used a sharp instrument to mark the historic day on the president's watch. He told the newspaper that, as far as he knew, no one had ever seen the inscription. "Lincoln never knew of the message he carried in his pocket," Brent Glass, director of the National Museum of American History said in a statement. "It's a personal side of history about an ordinary watchman being inspired to record something for posterity." Lincoln was elected the 16th president of the United States in November 1860. In the leadup to the Civil War, South Carolina and six other states seceded from the Union before Lincoln's inauguration in March 1861. A collector believes a photograph from a private album of Civil War Gen. Ulysses S. Grant shows President Abraham Lincoln in front of the White House and could be the last image taken of him before he was assassinated in 1865. If it is indeed Lincoln, it would be the only known photo of the 16th president in front of the executive mansion and a rare find, as only about 130 photos of him are known to exist. A copy of the image was provided to The Associated Press. Grant's 38-year-old great-great-grandson, Ulysses S. Grant VI, had seen the picture before, but didn't examine it closely until late January. A tall figure in the distance caught his eye, although the man's facial features are obscured. He called Keya Morgan, a New York-based photography collector and Lincoln aficionado, who helped identify it as Lincoln. Although authenticating the 2 1/2-by-3 1/2-inch photo beyond a shadow of a doubt could be difficult, several historians who looked at it said the evidence supporting Morgan's claim is compelling and believable. Morgan talked Grant into taking the photo out of the album and examining it for clues, such as the identity of the photographer. "Not knowing who the photographer is is like not knowing who your mother or father is," Morgan told Grant. Grant carefully removed it and was shocked to see the handwritten inscription on the back: "Lincoln in front of the White House." Grant believes his great-grandfather, Jesse Grant, the general's youngest son, wrote the inscription. Also included was the date 1865, the seal of photographer Henry F. Warren, and a government tax stamp that was issued for such photos to help the Civil War effort between 1864 and 1866. Morgan recalled the well-documented story of Warren's trip to Washington to photograph Lincoln after his second inauguration in March 1865. Lincoln was killed in April, so the photo could be the last one taken of him. Warren, a commercial photographer from Massachusetts, enticed Lincoln into his frame shortly after the inauguration by taking pictures of young Tad Lincoln and asking the boy to bring his father along for a pose, according to the book, "Lincoln in Photographs: An Album of Every Known Pose," by Charles Hamilton and Lloyd Ostendorf. "This is the first act of paparazzi ever toward a president," Morgan said. "Lincoln is not too happy at all." Historians say it has been decades since a newfound Lincoln image was fully authenticated. And in the Grant photo, it's not obvious to the naked eye who is standing in front of the executive mansion. You can see the White House, a short gate that once lined the building, and, on the lawn, a Thomas Jefferson statue that was later replaced with a fountain. Five people can be seen standing in front of the building. The tall man's face is obscured, but zooming in on the image with a computer reveals a telling beard. "Once you scan it and blow it up, you can see the whole scenario - there's a giant standing near the White House," Morgan said. At 6-foot-4, Lincoln was the tallest U.S. president. Morgan, who has sold photographs of Lincoln and other historical figures to the Smithsonian Institution, the White House and others, said he purchased the image from Grant for $50,000 in February. 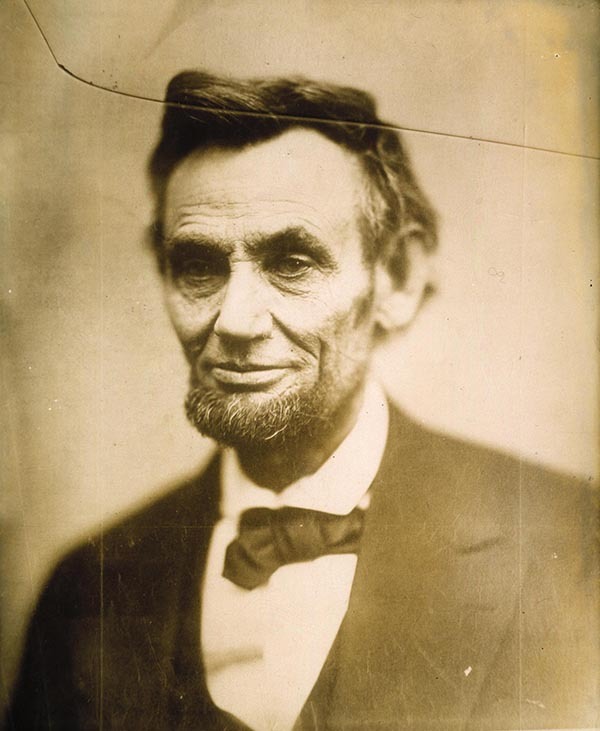 It will be added to Morgan's $25 million collection of Lincoln artifacts and original images. Several historians say Morgan has a good case. Will Stapp, who was the founding curator of the National Portrait Gallery's photographs department and who now appraises fine art and photographs, said he's usually cynical about such claims. But he said he was "very satisfied that it's Lincoln" in the pictures. "It looks to me like Lincoln's physique," he said. "I can see his hairline. I can see the shadow of his beard." White House curator William Allman said the photo appears to include Lincoln. "I guess there's always an element of doubt," he said. "It feels pretty likely, though." 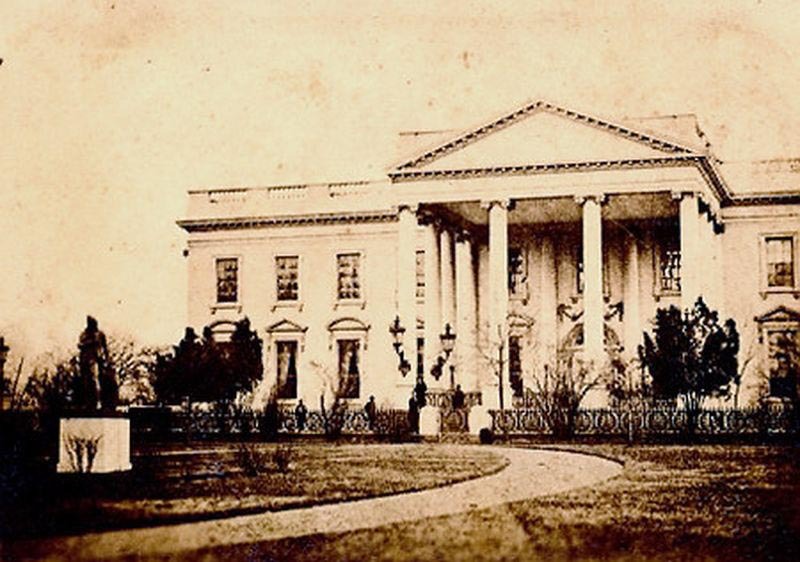 Even if it's not Lincoln, it would be among the oldest photographs of the White House. Lincoln artifacts have recently been hot commodities leading up to the 200th anniversary of his birth, and President Barack Obama has evoked his memory several times for his work to unify the nation. The significance of the photo is difficult to judge, Stapp said. It does show the relative freedom Lincoln had compared with presidents today, and offers a unique view of the White House from the 1860s, he said. "We don't so much think of (Lincoln) as living at the White House," Stapp said. "In that respect, I think it's an important find." On Tuesday, Morgan's gallery Web site was overwhelmed with more than 1,000 inquires and telephone calls about the photograph after history buffs read of his purchase, he said. To him, the historical significance is simple. "These photos were the last sitting of Lincoln," Morgan said of Warren's photography. "It's the last glimpse of the greatest American that ever lived."